The long-running Birmingham bins dispute, concerning "secret payments" and the "blacklisting" of workers, has ended after Birmingham city council today approved the agreement on 15 March that has ended the dispute. The bin workers accepted a pay deal of £3,500 to each member over blacklisting payments made to non-strikers in the 2017 dispute. 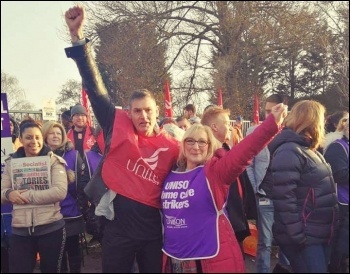 They reported on their victory at the Birmingham National Shop Stewards Network (NSSN) rally 'Defend workers from council attacks' on 12 March where they were also joined by striking home carers in the city. In all, 100 trade unionists and activists met to listen and discuss current local disputes as well as put forward demands, tactics and ideas on how to build a trade union movement against cuts to jobs, terms and conditions as well as saving public services. The floor heard inspirational fighting speeches from Unite union convenor and bin striker Dean Smith, Unison local government union senior shop steward and home care striker Mandy Buckley, Unite assistant general secretary Howard Beckett and NSSN chair Rob Williams, to name a few. While the bin workers have won, Birmingham's Labour council has yet to settle the 18-month-old home carers dispute over changes to working hours. Activists at the meeting highlighted how the home care strike is relatively hidden compared to the very public bin strike. They explained it shows the council's complete lack of regard for a service which assists vulnerable people. Suggestions were made that, in order to ensure the home care strike is victorious, Unison and Unite need to lead an all-out council strike against the deplorable Labour council attacks - and to defend jobs and public services. If the home carers get more muscle on their side and link their struggle with others this will give them a much better chance at saving their jobs completely, without any compromises with the bosses. Additionally, putting forward demands on councillors to set a no-cuts budget and to only take an average worker's wage will be steps forward to a genuine council fightback against the Tory austerity agenda. Furthermore, Birmingham Council has voted to cut another 1,000-plus jobs! Cuts which could potentially be made to the bin and home care services and elsewhere. What was agreed by the meeting is that, while the bin workers have won their battle and the home carers are still in theirs, Birmingham Council is set on waging a war on its workers and residents - making them face the brutal reality of the effects of these cuts. With people literally dying on Birmingham's streets, council workers and their trade unions need to go on the offensive now more than ever. Bin and home care workers can lead the way forward with this fight and inspire their co-workers within the council to join them on the picket line! This regional NSSN meeting provided the ideas and tools to develop further coordination between the unions and workers to defend their jobs - and hopefully can be the first meeting of many in bringing about action to save Birmingham services!